This film shows the making of a Pain Rustique French style bread based on a sourdough poolish (12 hour, 100%) with a high hydration dough, autolyse and stretch and fold technique in our Rofco hearth bread oven. We use German banneton's (baskets) for the final proofing. 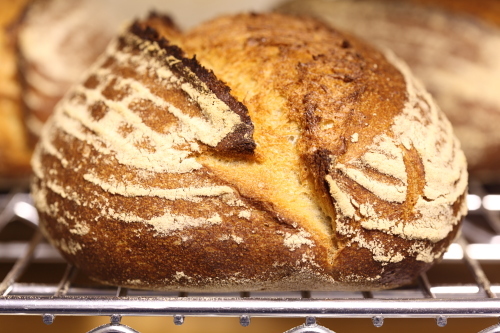 The recipe is an adaptation of the Pain Rustique (Jeffrey Hamelman's book ‘Bread') recipe, however I have changed it a lot to fit our taste, oven and European flour. Enjoy the real life ‘oven spring' of the bread filmed in the oven. It starts at about 2:41 in the movie. We filmed the bread in the oven for 15 minutes and sped it up to fit in about 1 minute. So you will see the bread rise and brown in real time! It is really cool to see, do not miss it! Note: The movie is filmed in full high definition quality (Full HD) so you can click on the ‘full screen' icon (second icon on the bottom right) of the YouTube movie and also the ‘HD' YouTube button and you will see it in very good quality, provided you have a broadband internet connection! That blew me away! Absolutely extraordinary stuff! I envy you that heavy brick you got in your oven... How long do you preheat it? The oven actually has 3 floors of brick, you can bake 6 breads in one go. The oven takes about 2 hours to heat up. The first hour it heats continuous and the second hour the heat spreads evenly through the bricks and oven only heats for a minute every 5 minutes or so. It is a Belgium handmade oven made by a small family ownded company for over 20 years (www.rofco.be). Great movie. Do you know what the real elapsed time was for the oven spring sequence? We filmed the bread in the oven for 15 minutes and sped it up to fit in about 1 minute. During the final 30 minutes in the oven almost nothing visual happens anymore. The bread browns a little more, but not a lot. After the bread has been in the oven for about 8 to 9 minutes I switch off the oven and bake on a falling temperature of the residual heat of the big stones (3 thick slaps stones!). The oven is complete isolated with thick walls and rockwool. Great video. I did raise a question in my mind; I seem to remember reading that salt and yeast should not be added at the same time (because the salt would kill the yeast). Obviously it work wonderfully in this example. Have I been mislead regarding the salt/yeast thing? Why try to keep the salt and the yeast apart when 2 seconds later when you start your mixer you mix them together into the dough? Amazing video! One question though, how come the steam does not fog up the glass? The oven is almost completely sealed and the steam vents are closed during the first 20 minutes of baking. Even with 6 loafs in the oven the glass does not fog up. Perhaps because the oven and the (small, 5 inch in diameter) glass has been heated up thouroughy for 2 hours? Enjoyed the video and that yummy loaf! I have been baking alternately in two different ovens and during the steam baking cycle with the oven temperature at 490 degrees, the window always fog up. Is your oven gas fired, Don? Mine is and I see steam as well as window fog when I add water to my pan of lava rocks. Lindy, both of my ovens are electric. I plug the vent holes with a bath towel during the steam cycle. Mini Oven thinks that the seals between the double glass window are probably not tight, letting the steam migrate into the space between the two panes of glass. The outer layer being the cool side condenses the steam into water vapor. Sounds logical to me. My glass window is single glass, just a little piece of glass floating in a metal circle rail. You can move it a little bit around and turn it within its rail. how can I get those ovens in the United States? I have family in Germany and Italy that can ship it to me but do they sell in the US? also I was wondering if the oven comes with automatic steam? or do you have to open the oven and use a water spritzer? For me, it's easier and quicker to add everything all at once. and amazing web site! Loved looking at the trifles! They are one of my favorite deserts. If you ever get to the big island here in Hawaii, I've got a spare bedroom for you and yours. It may cost a few bread baking lessons though!!! I'm so new at bread making that the thought of having an "in house" baker to work with would fantastic. Offer stands! I've been using some formulas that all for an autolyse but the yeast is already in it--only the salt is added after the autolyse. Is that a traditional method, or is the more traditional method depicted here, where salt and yeast are added after the autolyse? The shaping method was interesting (less tight and firm than I would expect) but it results in a beautifully formed loaf! Just lovely! I hope it tasted as good as it looked. All the books I have read on this matter describe adding the yeast and salt after the autolyse when they mention something about yeast and salt. My bible 'Bread of Hamelman' (I just double checked) adds the yeast after the autolyse stage although some yeast from the preferment is ofcourse present. I also just checked Dan DiMuzio's 'Bread baking' but he does not mention explicitly in what order to add yeast and salt when using an autolyse stage. I have found out, that a sloppy shaping gives me a more airy bread with bigger holes. 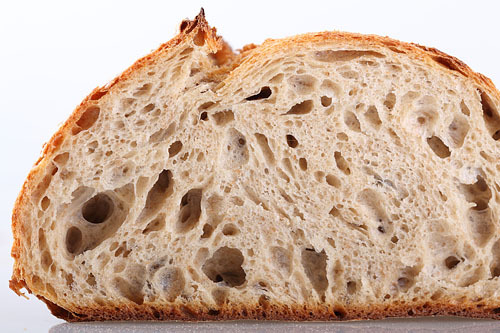 The tighter I shape the more tight the crumb becomes. Also I only use a 20 minute final proofing so I try to keep as much air in the dough as possible. What a great oven you have and thanks for sharing! Thanks for sharing. I like to sit and watch sometimes from the oven window, but I can never sit there for 15 or 20 min. Great video. I want the sound track. The video was great fun but left me lusting after that oven and your Haussler Alpha spiral mixer. From one filmaker and bread baker to another...great job on the video! I want the soundtrack too. I loved watching your folding and shaping techniques. And your oven spring time lapse was fantastic to see! It served to remind me that I should be slashing deeper - you can really see how that boosts the bloom. I'm jealous. But if I can have the sound track I'll get over it. ...from the album "Bakerman". Thanks for the video Pipo, it was entertaining, informative and educational. I'm going to try to incorporated some of your techniques into my next loaf. And we like the same music. Thanks. I downloaded the mp3 from Amazon. That's a very very cool video, I'm very jealous I always wanted to make a video with this soundtrack!!! your bread is beautiful, I like the way you shape it very gentle you keep all the honeycomb structure from initial fermentation just like tradition bread here in France that's the best! I was in the netherlands few months ago to visit and unfortunately I didn't encounter many good bakeries, but I wish I'd come and visit people who can bake bread like you do! Thank you all , for the nice comments! Thank you all, for the nice comments! This fall I was in France for 3 weeks and saldy I have to say the bread in our holiday region rated from very bad to excellent. Lots of bakeries make over inflated bagettes without any taste. It weighs almost nothing, it costs almost nothing and it tastes like almost nothing. But... When you hit a good bakery, it is like shopping in heaven. Nice tartles, wood burning ovens, long fermented breads. Great! We have tried about 20 to 30 bakkeries in 3 weeks, and sadly only about 5 were great! This is the same here in The Netherlands, good bread is hard to find and only when you know where to look and the best baker in Amsterdam, in our humble opinion, is from France. Yep this is a very big problem in France, sadly there is a big demand for the cheap disgusting baguette, I have worked in such bakeries and I wouldn't take any bread home. Very sad. But they are starting to bake more and more "tradition" baguette, which is very good in my opignon, loosely shaped to keep initial fermentation bubbles in the dough. But there's a huge gap between the basic village bakery and the wood oven organic bakery you can scarcely find around france. Calvel recommends adding salt at the beginning of the mixing process and no later than 3 minutes into the process. While a later addition helps gluten bonds and dough stregnth, "there is such a great decline on the quality of the taste of bread produced that it might be considered a general disaster." He recommends this regardless of the mixing method used. I've noticed a significant increase in aroma and flavor since following Calvel's advice. Thank you for posting that comment from Calvel's Taste of Bread. I think the myth about salt and yeast being intolerant of each other has caused this concern for adding salt later. Adding salt in the beginning helps insure that it gets distributed through out the dough and evenly flavoring the mix. Calvel made a strong statement about this and I believe he is correct. I'm still new enough to baking to make lots of mistakes. Thank goodness they haven't been so bad I couldn't eat the results. I got carried away one morning and was mixing the ADY yeast into the water with a bit of sugar and looked at the recipe and with out thinking added the salt to the mixture! I started to put it down the drain when I thought I'd leave it alone to see what it would do. I came back to it about 15 minutes later and found the yeast just as active as if there wasn't and salt added! I don't go out of my way to try the same thing again but I don't worry about the salt and yeast thing any more! Your bread movie was phenomenal; I enjoyed it very much. Now I'm searching for a copy of the music; see what you've done! Pipo is that oven primarly designed for commercial use?